If you meditate daily to reduce your stress you are wasting your effort. Meditation is a state of mind that allows you to take control of your subconscious power house. If you just meditate to still your mind, you are wasting a fantastic opportunity to go the next step that can only be accessed by meditation, hypnosis, auto-hypnosis, deep relaxation. Meditation is one way you cross the void between conscious and subconscious. It is the bridge to your super subconscious power base of high performance. If you do not know what to do with your subconscious and how to communicate with it, then you really have wasted your time. Neuro-fault Protection will show you how to meditate quickly, what to do before meditation, what to do when in a trance state, whether via meditation, hypnosis or deep relaxation. Meditation , auto-hypnosis, guided hypnosis and deep relaxation are all terms for the same state of being in a trance. When you know how you can instruct your super powerful subconscious mind to perform at a high level. Get it right and focus with commitment and the results can be amazing. Watch the top golfers and tennis players and you are seeing the result of subconscious performance. Watch the top penalty kickers in the World Rugby in Great Britain and you will see how Neuro-fault Protection performs in kicking a ball that is more like a banana than a conventional ball. Straight down the line and straight between the goal posts. That is rugby high performance. That could be the same for you in your job performance. All your effort goes straight down the line as intended, straight between the goal posts – no sweat – no stress. Imagine. Alternatively, if you have a poorly trained trainer or coach or you are doing a DIY job on yourself, you can really create some major stumbling blocks and that is not what is supposed to happen. That is what happens to the rugby penalty kickers who miss the goal posts. If you do not know what to do in the trance state two things may occur. You come out of the trance feeling relaxed and gradually you return to your stress state. Accidentally you open a void and something you know nothing about fills the space and that can be disastrous for you. 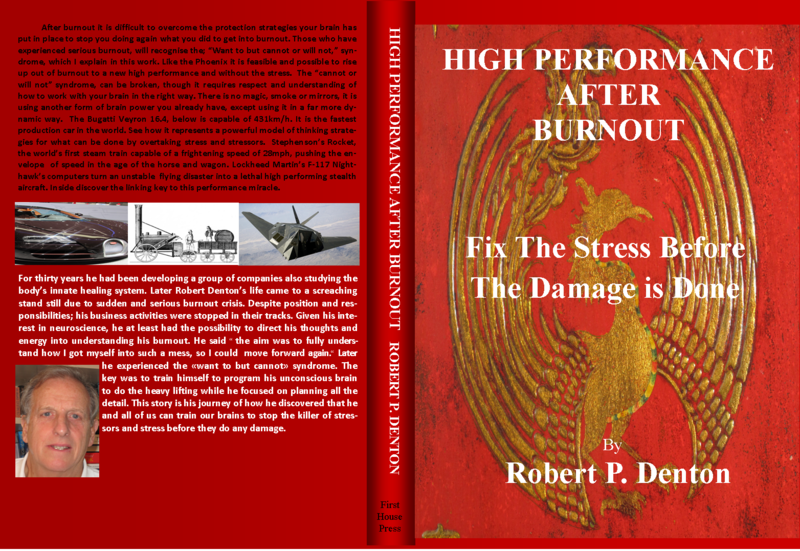 A layman’s guide to how your brain can work for you is all in Robert P. Denton’s new book ‘High Performance after Burnout’ ISBN 9781512294705 is available at www.amazon.com or order from your local book store.